Historians have tended to point to John F. Kennedy's 1960 bid for the presidency as the first time a candidate relied extensively on public opinion polls to drive a campaign. Polling has come to define American politics, and is perhaps most clearly embodied in Bill Clinton, the post poll-driven president in history. Melvin G. Holli dismisses this notion, however, and reveals that presidential reliance on public opinion polls dates back to the New Deal Era, when Franklin Roosevelt employed a first-generation Finnish-American named Emil Hurja to conduct polls for this 1932 and 1936 presidential campaigns. Holli shows us how Hurja convinced the Democratic National Committee to allow him to apply the new science of polling FDR's presidential campaign of 1932. Roosevelt's triumph at the polls in that year and again in 1936, as well as the spectacular 1934 Democratic mid-term congressional victory was legendary. 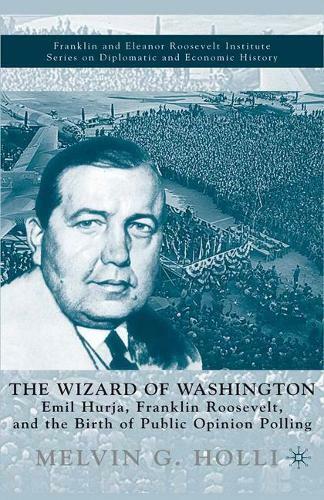 Holli restores Hurja to his rightful place in American history and politics, showing us that the Washington press corps were right on target when they dubbed Hurja the 'Wizard of Washington'.